Moments of connectedness can feel unfortunately rare in a place that is known for the “Seattle freeze.” But I get the sense more and more that Seattleites are craving that connectedness and seeking to build stronger relationships with their neighbors. The Buy Nothing Project, which began on Bainbridge Island, Washington, is a prime example. People request and share free goods and services—everything from furniture to kids’ clothing to lasagna—in hyper-local Facebook groups. You send fewer items to landfills, and you get to meet people in your community while you’re doing it. My neighborhood group is so active that it’s hard to keep up with all of the posts. I also felt this spirit of connectedness during PARK(ing) Day last month. Held as part of the Seattle Design Festival, PARK(ing) Day is an annual worldwide event where artists, designers and citizens transform parking spots into temporary public parks. My Aggregate teammates and I ventured out to explore the pop-up parks around Pioneer Square, the historic Seattle neighborhood in which our office is located. I was struck by the mood at each spot—people were happy and smiling and chatting. The frivolity of the parks helped create a lighter mood and drive curiosity. You wanted to talk to the people who had organized the space to find out what their park was about and to learn more about their organization or company. PARK(ing) Day aims to raise awareness about the importance of walkable, livable, and healthy cities and help people re-think how our streets can be used. I’d say it succeeds in doing so. 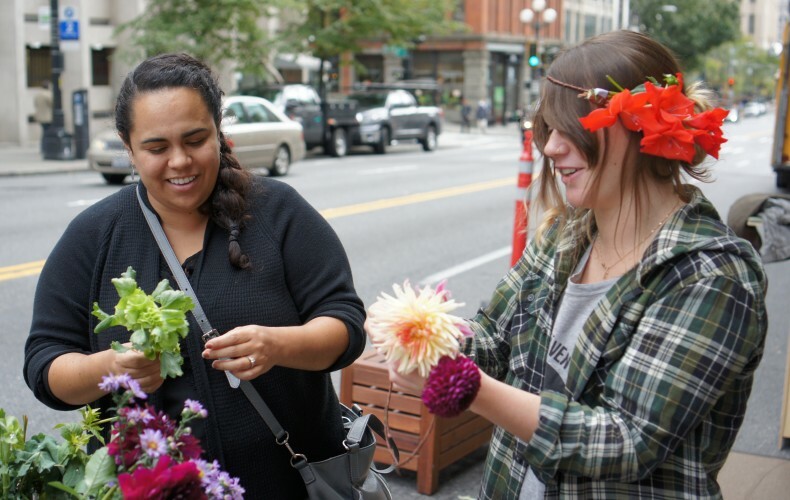 Creating a flower crown in the middle of First Street felt way better than sitting in traffic on First Street. Gaining a stronger understanding of the issues affecting Seattle—and hearing diverse perspectives on the potential solutions—also helps me feel more connected to other residents and to our city. I enjoyed hearing from designers, architects, community organizers and activists and discussing ways to design for equity at the Seattle Design Festival’s conference. 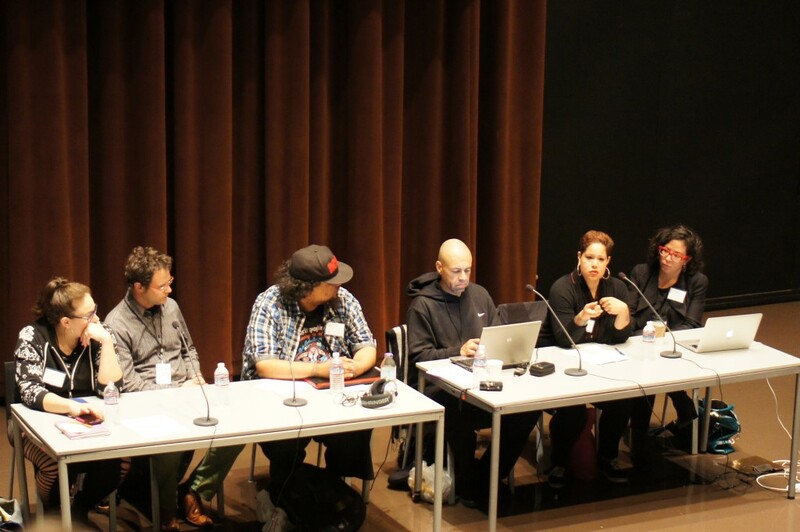 It was refreshing to see a conference focused on equity live up to that ideal—it was free, open to the public, held at the public library in downtown Seattle, and the panelists were fairly diverse in terms of gender and ethnicity. The discussions featured grassroots organizers and activists who are working every day to tackle social justice issues in Seattle. I learned about the recommendations that came out of Seattle’s Housing and Livability Agenda, which seeks to address our city’s dire lack of affordable housing. I also learned more about efforts to stop King County from building a new $210 million youth jail in the Central District and a City Council resolution to ban youth detention (which has since passed). I appreciated the panelists’ honesty and directness. They named the three architecture firms signed on to build the new jail—one of which was a sponsor of the conference—and asked them to step down from the project. 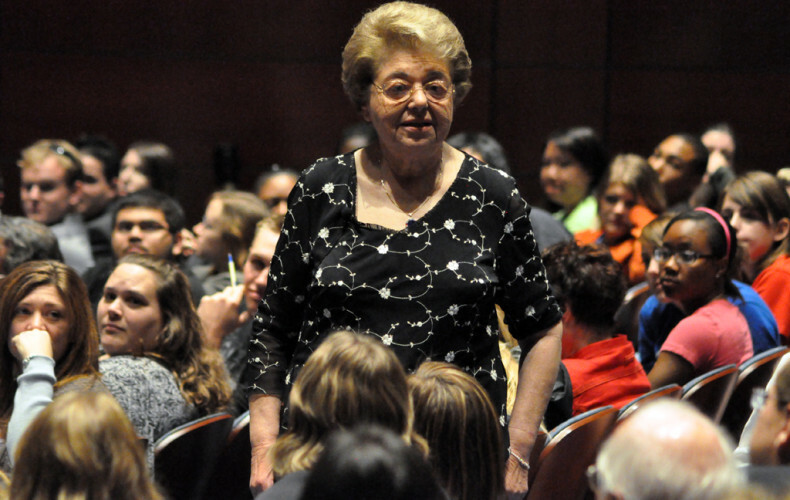 The panel was effective—I gained a deeper understanding of a crucial local issue, and I was compelled to act. I went home and emailed each City Council member about the resolution. We need more events and programs like the Design Festival and the Buy Nothing Project. We need to bring people together in public spaces and break down the barriers that prevent us from talking to our neighbors. What events and programs help you connect? I’d love to hear about them. A couple days after seeing Life Itself, a wonderfully inspiring documentary about the life of Roger Ebert, I continue to be struck by seemingly conflicting emotions: nostalgia for old media and an appreciation for the opportunities brought by new media. As the film chronicled Ebert’s career, I longed for a time I was never really part of—the romantic era of print journalism. I grew up in the two-newspaper city of Chicago, where Robert Ebert, Gene Siskel, and the other writers featured in the film were indomitable forces. This strong media environment had a big impact on me. I declared myself a journalist at the age of 11, when I began to write opinion columns for my elementary school newspaper, and would go on to become a professional journalist for the early part of my career. As Ebert’s friend William Nack flipped through the print archives of the Daily Illini, recalling the many great pieces Ebert had written as a student—and as the narrator read excerpts of Ebert’s best work from the Sun-Times—I recalled that prideful feeling that came with reading my old clips and that sense of camaraderie that came with working in a newsroom. I was saddened to see that several of the film’s interview subjects were simply given the title, “Chicago Newspaperman,” yet it felt accurate—most of these old-school journalists are probably now out of work or have been forced to retire. But the film also made me incredibly optimistic for the future—it reminded me why I love digital media. 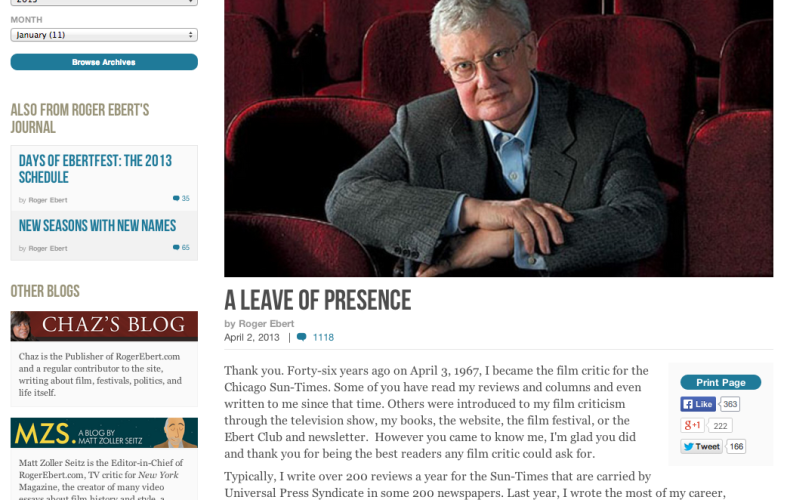 As Ebert lost the ability to speak due to cancer, he turned to his blog, Twitter, and other forms of social media. The Internet gave Ebert a voice when he feared he no longer had one. This approach is consistent to the way Ebert lived his life and pursued his career. He’s an innovator who brought movie criticism to the masses and published his reviews to Compuserve in the early days of the Internet, after all. In the film, Ebert described the ways that his blog fueled him, providing him a channel to the outside world at times when he was confined to a hospital bed. Just two days before his death, he published a piece providing updates about a KickStarter campaign he was planning, the 15th year of his film festival and the re-launch of his website, which provides access to his life’s work so that future generations can enjoy everything he’s written since the 1960s. This wouldn’t have been possible 20 years ago—just as his rise as a dominant voice in the film world likely wouldn’t be possible in today’s fragmented media landscape. In a world of hoaxes and comment trolls, I can easily be jaded by the trappings of our online world. Stories like Ebert’s remind me of the power of digital media—the power to tell one’s own story on one’s own terms, the power to connect across continents and across generations. It is these stories—such as an Auschwitz survivor’s use of Facebook to search for his long-lost twin brother or a puppeteer connecting online with those who need his 3-D printed prosthetics—that remind me why I love working in this field and why I’m happy to live now, surrounded by it all.